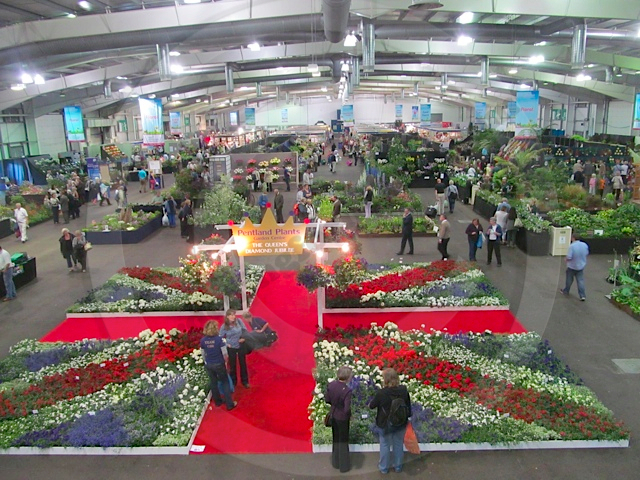 The first day of Gardening Scotland 2012 on Friday 1st June got off to a fantastic start. With weather in the early morning looking as though rain may threaten again, the sun managed to burn through the clouds to bring the day to a sunny but breezy 15 degrees. Water left from the previous day’s downpour soon dissipated to leave everything fresh and vibrant. Car parks filled quickly for the 10.00am opening and by 10.30am crowds were already gathering 2 or 3 deep around the colourful and varied show gardens with people eagerly purchasing zesty aquilegias, the latest colour changing hydrangeas and silky blue meconopsis from the nearby traders. 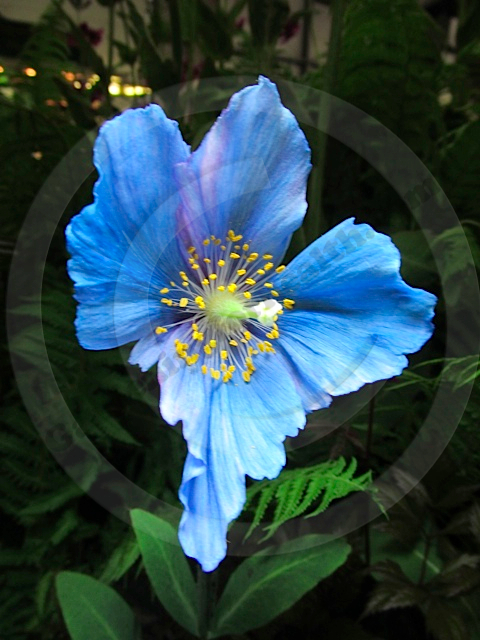 Meconopsis betonicifolia or Himalayan Blue poppies were striking a pose centre stage on many of the show gardens and plant suppliers stands, favouring the cooler, damp and shady conditions often found in Scotland. All but a few exhibitors at Gardening Scotland were local to the region and this was instantly evident in the species of plants available. We were treated to stunning displays of primulas, tiarellas and alpines among others, all of these suiting our equally solar challenged, damp Cumbrian climate. A general relaxed atmosphere pervaded with plenty to see and do for all ages. The youngsters took an instant shine to the miniature railway in the lavishly planted Caulders Garden Centre and G Scale Scotland ‘A Railway in Your Garden’ show garden. Held at the Royal Highland Centre in Edinburgh which is adjacent to the airport, this venue puts Gardening Scotland a cut above some of the rest. A purposely designed indoor arena hosted the Hopetoun Gardens Floral Hall and designated areas to sit and eat or just take the weight off your feet, combined with a well laid out plan of the show ground made this a very pleasant day out. The BBC Beechgrove Garden Theatre offered regular gardening advice with questions and answers sessions from well know presenters, whilst the Zero Waste Scotland Cookery theatre showed us all how to be a little more thrifty in the kitchen and make the most of Scotlands’ fresh, seasonal produce. Great emphasis was placed on insect friendly habitats as well as encouraging children to take an active part in gardening. A unique feature was the Scottish Gardeners’ Forum Pallet Garden Challenge, sponsored by Dobbies. 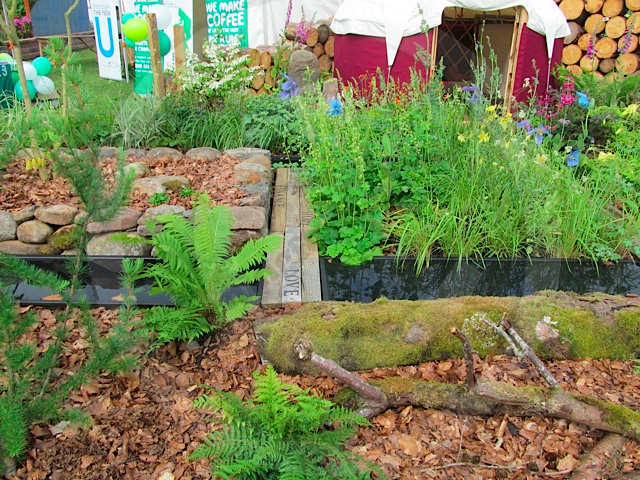 where local schools, amateur gardening clubs and horticultural societies throughout Scotland each had a garden plot no bigger than 1m square in which to create themed designs. The Gardening Scotland show runs for another two days on Saturday the 2nd and Sunday 3rd June and is well worth a visit. We have much more to bring you from the event but a lot of fresh Scottish air combined with a rather special glass of whisky means that we will be leaving this until tomorrow!